The showcase event of the world’s most provincial sport takes place on Sunday in Dublin. A Galway squad takes on Waterford in the All-Ireland Hurling final, as Croke Park will be packed with a crowd of 80,000. In the U.S. or any nation other than Ireland, this matchup, and any hurling event, might have trouble drawing a crowd of 800. The game’s failure to catch the world’s fancy is understandable. If you didn’t grow up playing hurling, you can’t play it. The required skill set—including the ability to catch a hard ball with one bare hand and hit it with accuracy 75 yards from the left or right side while on the run—is too difficult to really pick up after your formative years. But while the rest of the world will ignore what’s taking place in Dublin, all of Ireland will shut down on game day. Irishmen and Irishwomen that aren’t in the stadium will wish they were. I learned this the hard way: The 2003 hurling final took place during my first trip to Ireland, and I went to Croke Park several hours before game time without a ticket but with a wad of Euros and a certainty that I’d be able to buy my way in. (This was before StubHub or any online sites, when street sales were still the default MO for tickets selling). I’d shown up similarly ticketless and cash-rich at what I regarded as bigger events back home before, including Texas vs. Oklahoma, the Red River Shootout, held at the Cotton Bowl at the Texas State Fairgrounds during the middle of the damn Texas State Fair and in a year when both teams came into the game undefeated. So I pooh-poohed the Irish folks who warned me in the days before the game that I’d never seen anything like what’d I see in Dublin on game day. They were right. I spent hours wandering the streets outside the stadium with what I’d guess to be about 100,000 other ticket seekers. Not only did I not get in, I never even found a single scalper before giving up and watching the game in a pub. 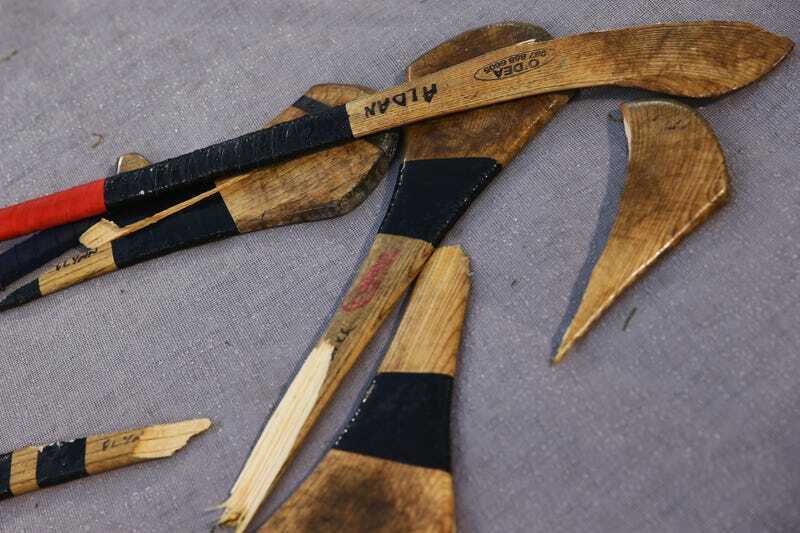 For all the game’s blood-and-gutsiness, literates looking for an excuse to give hurling a shot can lean on its importance to James Joyce, who put references to the sport in his big works. She swore to him as they mingled the salt streams of their tears that she would cherish his memory, that she would never forget her hero boy who went to his death with a song on his lips as if he were but going to a hurling match in Clonturk park. Enhancing the aboriginal ardor: GAA athletes can only play for their home counties, with the association relying essentially on the boundaries of the 32 counties in Ireland in 1884. And all hurlers are now and have always been amateur, despite all the commerce the game has long produced through Croke Park sellouts, jersey sales and, as of this year, a TV deal with SkySports. Gerry McInerney, who was on Galway teams that won All-Ireland titles in 1987 and 1988, once told the New York Times that because there was no hurling salary, he was forced to live in New York in the offseason during his playing days to work construction, despite being a superstar in his native country. “You might get a couple of pints,” McInerney said of his sporting pay. And make no mistake: The top hurlers are heroes at home: During my recent trip to Ireland, the reposal and funeral for Tony Keady, the best hurler in the universe in the 1980s, shut down half of Galway for a weekend. There has never been any major hanky-panky regarding one county poaching another county’s athletes, or a hurler changing addresses to play for a squad with a better shot at winning the All-Ireland championship, or under-the-table payments to keep stars playing—at least according to every devout hurling fan I asked. As I can now attest, hurling at its highest level and in a live setting has more than enough action, drama, and sticks to the face to grab any sports fan, regardless of national or county loyalties. Not wanting to repeat being shut out of Croke Park, I bought tickets for a 2017 All-Ireland semifinal online and months before the game. Watching with my family and 72,000 fans who screamed from the pre-game players parade until the final whistle, Waterford’s win over Cork thrilled me as much as any sporting event I’d ever attended. And now, like all of Ireland, I can’t wait to see this year’s final. Galway will be seeking its first All-Ireland championship since 1988; Waterford won its last title in 1959. I was reminded earlier this week that my enthusiasm for the big game won’t be shared by many folks on this side of the pond. I had phoned the biggest Irish bar in the D.C. area, where I now live, and asked the guy who answered if they’d be showing Sunday’s hurling match. Good god. Hurling is hurling, I told him. CORRECTION: A previous version of this story said Waterford won its last All-Ireland title in 1958. Waterford’s last championship came in 1959.